In Thailand, green papayas are probably eaten more often than ripe papayas. On the island of Samui in the Gulf of Thailand is a lovely family-run beach resort. Idyllic seaside bungalows are surrounded by some of the most beautiful papaya trees I have ever seen. The first time I stayed there, I was so charmed by the unusual stature of these trees with their majestic, deeply cut foliage. Clinging to the trunk of each tree must be at least a dozen large, emerald green fruits, soon to ripen in the tropical heat. I remarked to the owner that he must never need to worry about having enough sweet, luscious papayas to satisfy the steady stream of tourists who come and stay at his resort. I knew exactly what he meant. Papayas are more often than not picked by locals while still green to be made into a spicy salad, a favorite food among Thai, as well as Laotian, Cambodian and Vietnamese people. I wouldn’t be surprised if more papayas are consumed green and crisp in Southeast Asia than golden orange and soft. 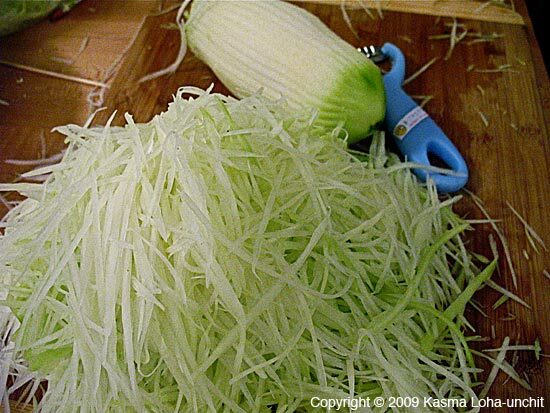 A tribute has even been made to this fruit in its unripened form in the film “Scent of Green Papaya,” with a prominent scene showing green papaya being chopped and made into salad. 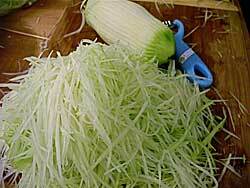 Green papaya has a very mild, almost bland, taste, but it is the medium through which robust flavor ingredients take body and form. It picks up the hot, sour, sweet and salty flavors, giving them a unique crisp and chewy texture unlike that of any other vegetable. When made into salad, you wouldn’t know that it was mild and timid; you remember it only as bold and spicy. 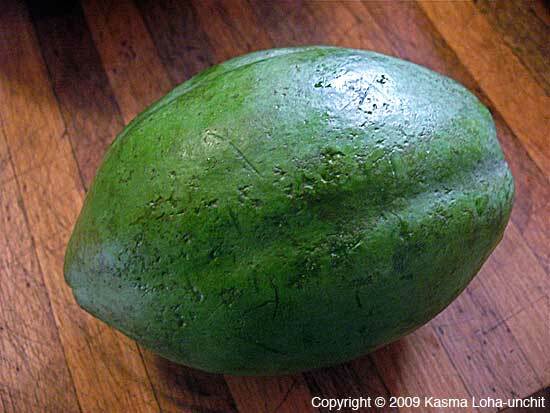 Unripe papayas are readily available in various sizes and shapes during the summer at many Asian markets. Select one that is very firm with shiny green peel suggesting that it is as freshly picked as possible. Even green fruits will eventually ripen and turn soft if allowed to sit around for some time. 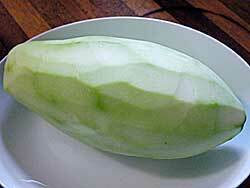 There are many ways to make green papaya salads, with varying degrees of hotness, sourness and sweetness. The hottest salads are probably made in northeastern Thailand and Laos where they are eaten with barbecued chicken and sticky rice as a staple food of the populace. There, the salads are made by bruising julienned green papaya with garlic and very hot bird peppers in a large clay mortar with a wooden pestle, then seasoning with lime juice, fish sauce and other flavorings. Give the green papaya salad recipe a try. See our website for more Thai recipes and more Thai ingredients. This recipe is also available on our website as: Green Papaya Salad (Som Tam). 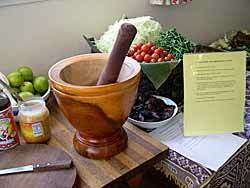 If you have an average-size Laos-style baked clay mortar with wooden pestle, you may need to make the salad in two separate batches. With an extra-large carved palm wood mortar and pestle, the salad can be made in a single batch as follows. Pound the garlic and Thai chillies together until they are pasty. Add the dried shrimp and pound to crack. Follow with the salted crab (if using) and long beans and pound well to bruise. Add the palm sugar, juice of two of the limes, and fish sauce and stir well. 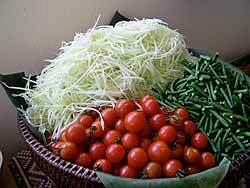 Add the julienned green papaya. Toss well with the seasonings. Then, pounding with one hand and stirring with the other, bruise the green papaya until it picks up all the flavorings and seasonings. Taste and adjust as needed with more fish sauce, lime juice or palm sugar to the desired flavor combination. 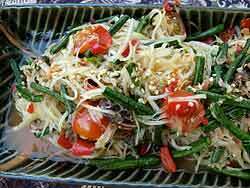 Ideally, for a Thai, the salad should be very hot and sour with only a light sweetness at the back of the tongue. Add the tomato pieces at the end, stir and bruise lightly to blend in with the rest of the salad. Transfer to a serving plate and sprinkle with peanuts. Serves 6 with a side plate of raw vegetables, as desired, in a multi-course family-style meal. Written by Kasma Loha-unchit, May 2010. This entry was posted on Thursday, May 27th, 2010 at 12:05 am	and is filed under Cooking, Food, ingredient. You can follow any responses to this entry through the RSS 2.0 feed. You can leave a response, or trackback from your own site.